When you think of Mexican food you probably think about Tacos and Enchiladas from your favorite Mexican food Restaurant. Truth is, there are so many great recipes that most people have never even heard of. 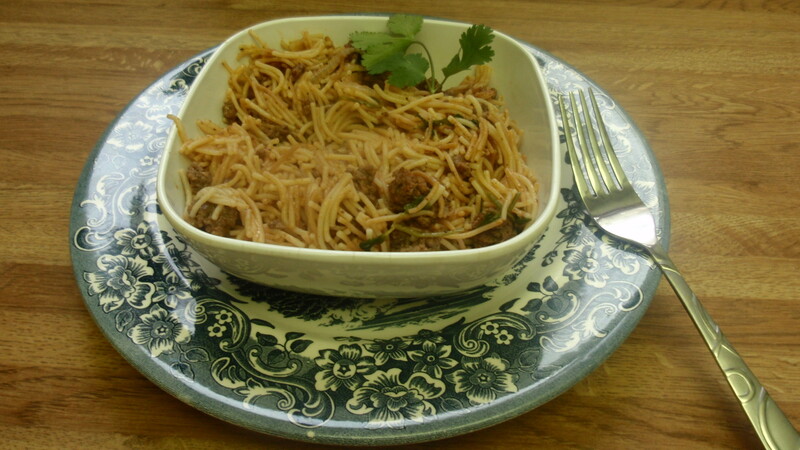 Today, I’m sharing my recipe for Fideo. This is actually my mom’s recipe, who in turn learned it from her mother and so on. My kids call this Mexican Spaghetti and I would consider it to be one of the best Mexican comfort foods there is! 2 packages of Fideo noodles (Vermicelli noodles). In a large skillet, brown beef using a small amount of Vegetable Oil if desired. Cook until no longer pink. Remove Beef from pan and drain out grease. In the same skillet, add ¼ cup of oil then add the Fideo noodles to brown. Stir noodles constantly to avoid burning. When Fideo noodles look slightly whitish, brown add the beef and the Chicken Stock.. Stir in all spices, Tomato Sauce and Cilantro and Onion. Allow noodles to come to a simmer, then cover and cook until all liquid is evaporated. If the noodles get dry before the cooking process is complete add additional Chicken Stock or if none on hand add water. Check for salt and pepper and serve to your family for a truly comforting, Mexican experience!